A Rare Opportunity to See an Ancient Craft in Action! From selecting the leather to stitching and hand lasting the uppers, to lacing them up, every process is captured on video, with narration and titles. This video is Informative & Entertaining, as well as an Educational Experience. However, it is not an instructional video on how to make shoes. 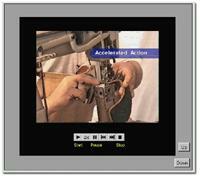 For instructional videos about Shoemaking visit the Workshops - Distance Learning Project. Included in the package is a 125 Page Digital Book on CD ROM, with over 450 Color Photos, published for Acrobat Reader. This book is a color photo essay of the "The Shoemaker Movie". The entire 125 page book, or selected pages, can be printed from Acrobat Reader. The pages can then be comb bound or inserted into a standard 3 ring binder. The printed book can be used as a guide while viewing the video, or it can be used as an off-line reference book. "Accelerated Action" created with digital editing means you get to see all the action in less time than it really takes. We can no longer accept Orders Outside North America due to shipping restrictions. This DVD Video is created for Viewing on TV. From the stitched upper through hand lasting, applying the soles, and finishing the shoes. Watch as the raw materials begin to take shape! See how the upper is magically transformed into the final shape of the shoe, as it is molded over the shoe last. - Lace 'em Up ! The Digital Publishing medium allows for many new and creative books to be published using Interactive Text, Graphics, Video, and Color Photographs to convey their message in depth. Transformational technology makes it possible for many people to be entertained while learning through their multi-media experience. "The Handcrafted Shoe Book" is a pioneering publication. This Digital Book comes alive with frame-by-frame color photos and captions taken directly from the video. Print out the complete color book for your personal library or your coffee table, as a conversation piece! The Perfect Gift for Shoe People ! Digital Video Editing allows you to view all the action by speeding up the sections that take awhile to complete in "Real Time". You can use the Digital Video Controls to go back and forth as often as you like to catch all the action in detail. Video Controls allow you to Pause the Video, Watch Frame-by-Frame, Digital Rewind & Fast Forward makes it possible to review the action over and over. On Screen Titles of important action keep you informed of the process as you see the pieces of leather transformed, like magic, into the Finished Shoes! This video was created with multiple camera angles all running at the same time. The wide angle cameras follow the Craftsman at work in the studio. The overhead camera gives you the same view as the Craftsman, of the work in process. This view is the closest experience you can get, without actually doing the work yourself. First Class US Mail is included in the price. 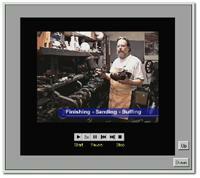 ShoeSchool will replace any defective DVD or CD ROM product within 30 days of purchase. All Sales Are Final on Digital Publications. No Refunds or Returns, Except for Warranty.